Chalk it up to being new parents, but yes, we did throw a birthday party for Avery. She won't remember it, but here are the pictures to prove it. And she did seem to have a good time. 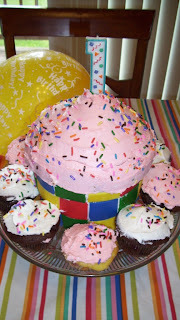 The cake above is supposed to be a large cupcake surrounded by regular cupcakes. Not bad for an amateur attempt at cake decorating. Prepping for the party was a whole family affair. Here you see Bob-Bob and Aunt Amber manipulating the fondant for the birthday cake. I had given up on it. The only reason they are both working on it is because it really was this difficult. At the party, Kevin made yummy hamburgers and we all visited and played the Wii. This was Avery's favorite thing to do. After digging in the ice for awhile she would pull out her fingers and show them to me. Explaining the freezing properties of ice is lost on a 1 year old. Of course Avery ate cake, but this is about as much as she got into it. She was still a bit overwhelmed that the whole room was standing around staring at her. She received lots of great gifts that she is still enjoying today. After opening gifts she visited with some of the guests. Here she is reading one of her new books. So after all the planning and prep, it was in the end, a 1 year old birthday party. The guest of honor did a great job for the most part and we definitely appreciate all who joined us. Here is a video of Avery enjoying the slide that Grams and Bob-Bob bought her. At some point she will figure out that she is supposed to be sliding down and not just the toys, but for now this is sweet. She and Bob-Bob laughed at this game for quite a long time.